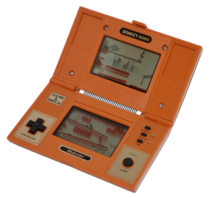 Despite their simplicity, Game & Watch handhelds were completely unemulated for a very long time due to a lack of information about their hardware and difficulties with dumping ROMs and accurately recreating graphics. After an extensive reverse engineering effort by several MAME developers, MAME became the first emulator to support many retro handheld electronic games, including a few Game & Watch systems. It was officially the 1st Game & Watch emulator, with support for a growing but still limited number of games (An example being Mickey and Donald). It started to comprehensively cover the Game & Watch games from around just before mid-2017 (e.g. 0.185 in May 2017) and emulated its first game in 0.186. For the games, it does support, MAME is recommended, although most Game & Watch games still can only be played outside of the original hardware through simulation. See MAME driver which covers several of the Game & Watch series of games and those of a similar ilk from other companies running on the LCD game handhelds with Sharp SM5xx family of CPUs (SM510/SM500) (Other companies that released similar games included Konami, Elektronika, Tiger Electronics, Tronica and VTech). It was officially the 2nd Game & Watch emulator. The initial commit for DSP was uploaded to GitHub on January 12, 2010. Although, just before mid-June 2017, it started to emulate a few notable Game & Watch games JUST after MAME's team researched the handheld series and then emulated the first of the games. Although Game & Watch emulation has recently become possible, it took quite a while to achieve due to the lack of information about the microcontrollers driving them and the high difficulty of dumping the ROM from a system. (To dump a game's ROM, the microcontroller must be decapped, which is not only very costly and complicated but highly destructive to the system.) The lack of information on the Game & Watch's hardware leads to the false belief that it does not contain a CPU or ROM and therefore could not be emulated. Even though this was disproven after reverse engineering efforts of several MAME developers led to support for a few games being added to MAME, emulation of additional games is progressing slowly due to the high amount of time and patience it takes to dump their ROMs and recreate their graphics. For most Game & Watch games, this is your only option outside of buying them used.